Both using Simplicity Pattern 4589 and fabric I bought in Japan. 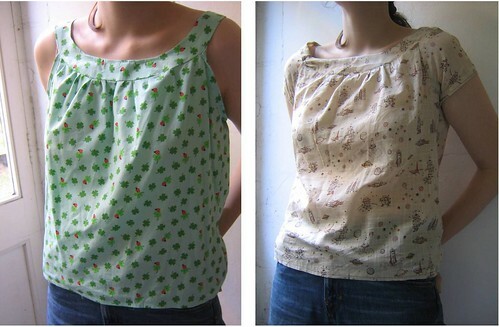 My sewing, as ever, could be better, but they're fine if you don't look too closely. The ladybirds one was way too big, even after taking it in, so I cut a size down for the robots (and made it on the smaller side) and it fits perfectly. The ladybirds one looks fine under a cardigan though, or if you don't mind the super-smock look. Next up, the knit. 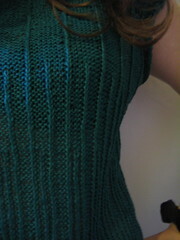 The pattern is my own, from the first edition of Yarn Forward. As I've posted before, it was inspired by bubbles in a champagne glass, but the eyelets in this green version are making me think of light coming through tall trees. I'm really pleased with the result - it's come out exactly as I hoped. I wish I'd charted it though - if anyone's trying the pattern, email me and I'll see what I can do (though I can't promise anything instantaneous). I used Euroflax Linen in emerald. 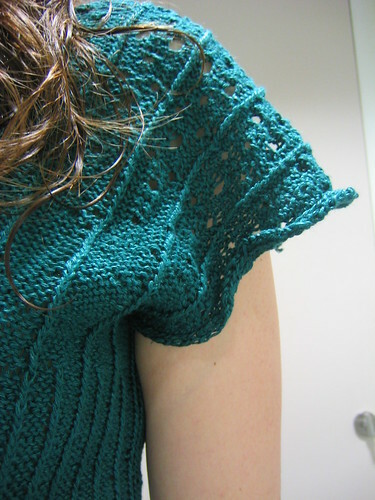 It's strength gives a nice 'tree-like' construction to the sleeves, and it's softening up nicely even if it was pretty rough to knit with. It's sportweight, not the 4ply of the pattern is written for, so I cast on for the smaller size. Yet, for me the true meaning of SSK will always be a geeky one: Sociology of Scientific Knowledge. And on that, I'm going to a History of Science conference in DC this week, giving a paper on the Professor Branestawm books. Then I have a week off (last real break before thesis hand-in at Easter). I'll wander around DC for a bit, then I'm visiting a friend in LA, taking a bus trip up to San Fransisco and, as my flight home goes through Newark, finishing off with 24 hours in NYC. Thanks for all your comments on the last post. 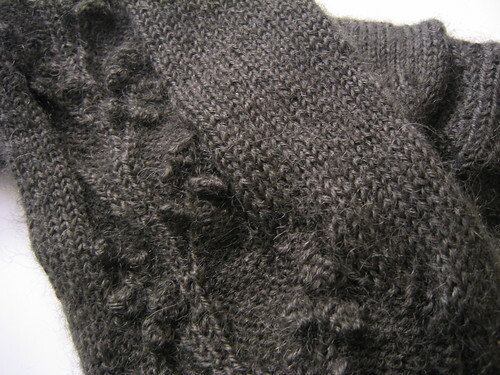 I've been tracing through comments on other blogs too, and a few threads on ravelry. All interesting stuff. I was contemplating a follow-up post musing on the politics of fantasy, but I really should be channeling such energies into my thesis. 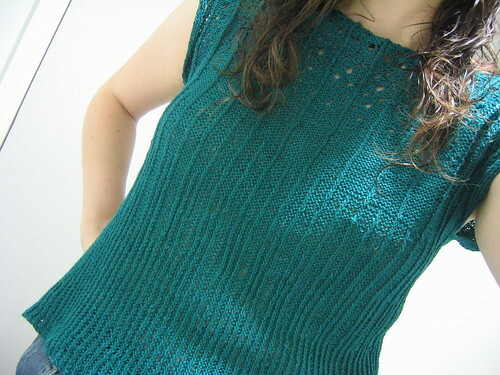 Instead, I'll go with an unexcused celebration of one of my personal indulgences, and show off an FO. It'll be winging its way to a friend as fast as Royal Mail will carry it, along with pattern and yarn for the second sock and some other bobbly-themed goodies (e.g. some beaded icord). Pattern: My own, based very loosely on Martin Storey's Rambling Rose ("inspired" I think is the term). 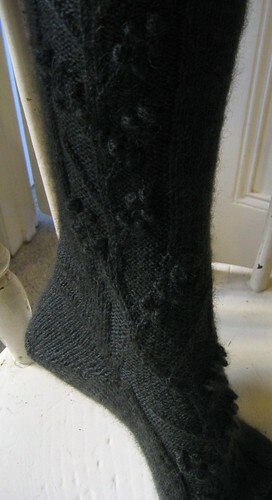 The vine motif starts at the toe, and grows as you knit, winding itself up the side of your ankle. I'm thinking of developing it further; making it a bit more complex. If I do it again, I'll use a crisper, lighter yarn so its easier to photograph (in real life it looks lovely, but dark colours, fuzz and blogging are not a good mix). Yarn: Wensleydale Longwool 4ply. I wanted a very English yarn, as my pal's in the US. It's very warm and soft, and apparently it wears pretty well. The fuzz gives it a really yummy, mossy look - a very sniffable yarn. Erqsome's recent post pointed me to this wonderfully thoughtful review of 'the domestic in drag' (i.e. 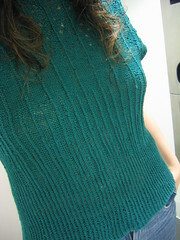 much of the knit, sewing and baking blogosphere, Nigella...). I think Ashley, in her comment there, has it spot on - its not that craft is a feminist issue, its that celebrations of 'the gentle art of domesticity' raise questions of class. I stopped reading Yarnstorm a while back because her celebration of a particular form of upper-middle-class life bugged me a bit. Similarly, I start screaming at the telly when Nigella says things like 'If you only have the one oven'. I'm not necessarily judging them, class can largely be a cultural thing - they happened to choose a slightly different life from mine. I do have my personal opinions on recycling, state education and (ahem) use of the British Library which at times various 'domestics in drag' have inflamed. But I tend to choose to keep them relatively personal. This is partly because I tend to think direct confrontation isn't always the best form of political action, but also because I know my craft blog is a heavily filtered version of my life, only really showing parts of me as they mix with knitting (and occasionally baking and sewing, the knitblogosphere having intersected with other domestic crafts). This is a window into my life, as it is to others. But it is just a single perspective. I assume the same is true of Yarnstorm et al, and wouldn't think it fair to criticise directly. Still, the economics of craft is something we should think about more. Just as Nigella preaches that a little of what you fancy does you good, yet has taken it to a rather sickening degree in her latest series (I don't think compulsive eating is healthy - for you, society and the planet), piles and piles of yarn stash are to me, a symbol of over-consumption. Just because its handmade doesn't mean it isn't capitalism. That doesn't necessarily make it wrong, I'm not preaching anti- or pro- any particular ideology. I just want to emphasise that craft is economic, and therefore political in more ways than one. I don't think I know the right or true way on any of this though - this post is a mix of things I happen to be thinking and ideas that are at the front of my mind. I'd be interested to know what others think. 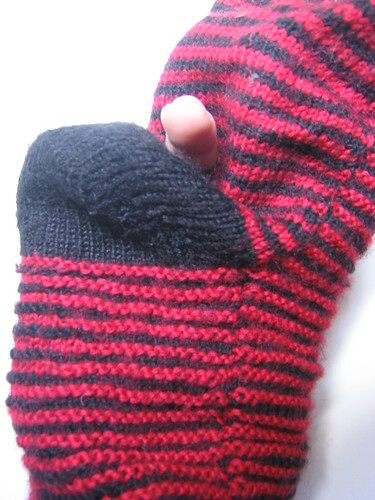 When you leave your handknit socks for the winter, don't just leave them at the bottom of your washing pile thinking "yay, I don't need to wash them for six months". Dirty socks attract moths a lot more easily. Yeah, that is my middle finger sticking out of the hole - the munching, flying little beasties. I've washed the socks anyway, and once they're dry I'll see if I can darn the hole, but it's pretty big. In my some of my favourite socks, too (the lovemeknots). Next spring, I'll remember to wash them all, carefully fold them and put them away securely. Possibly sealed. For the time being, I'm remaining vigilant, and Kirsty invested in a few anti-moth herb sachets (which are strong-smelling, and I haven't stopped sneezing since she opened them up, but at least won't make the flat stink of mothballs).